Ladder Stand Hoist 500 lifting a ladder stand. Ladder Stand Hoist attached to a ladder stand. Ladder Stand Hoist 500 attached to a tree ready to lift. Tree Stand Hoist 150 lifting a tree stand into place. This hoist features 30' of 1/2" solid braided rope. It also has a 2:1 pulley which is easy to install for heavy lifting. Also by pulling the release rope it makes it easy to lower heavy objects. Removing the 2:1 pulley you now have a 30' hoist or tie down. This would work great for any thing that you have to lift or tie down. ​Hang em High Hoist is ideal for hoisting heavy and hard to lift items over head and then securing the items without tying knots. This hoist features 20' of solid 3/8 braided rope. It also has a 2:1 pulling ratio. 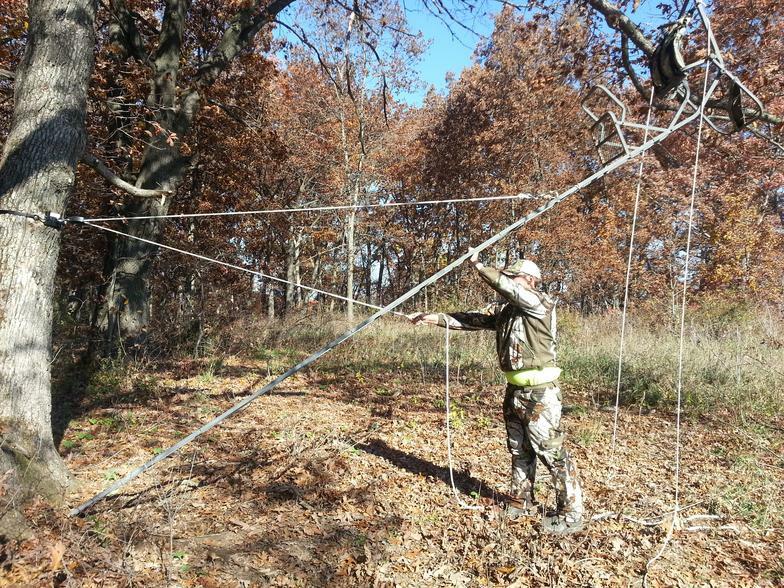 ​This hoist allows one person to install tree stands, ladder stands, and double ladder stands by themselves. It includes a 2:1 pulley, spring clip, and 5' double looped rope for ladder stand hook ups. It also has a 8' release rope for hoisting objects over head. This hoist is so wonderful that you will find many projects for it year round in your garage or on the farm. ​Tree Stand hoist 150 lb is the easy, safe way to hang tree stands. The Tree Stand Hoist is a hands free system that easily adjusts to any tree leaving both of your hands free to install the stand. Tree Stand hoist 250 lb is the easy, safe way to hang tree stands. The Tree Stand Hoist is a hands free system that easily adjusts to any tree leaving both of your hands free to install the stand.. It is also assists in pulling up a ladder stand. ​This product is the heart of the Tree Stand Hoist. For the hunter who is looking for safety installing a tree stand, ladder stand or lifting deer in the woods.